Rock House Cave in Petit Jean State Park is located near Morrilton, Arkansas. This is a great, accessible example of a bluff shelter atop beautiful Petit Jean Mountain. The Ozark Mountains of Arkansas are famous among archeologists for bluff shelter sites. These are naturally occurring rock overhangs common in the area because of the geology of the region. Bluff shelters were extensively used by prehistoric peoples and are especially interesting to archeologists because the dry conditions in many shelters promote the preservation of usually perishable artifacts. 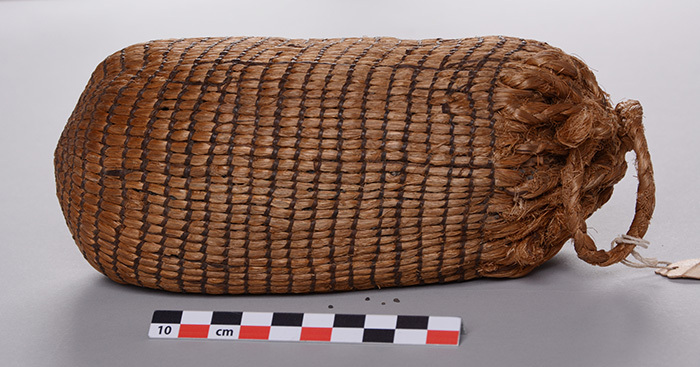 They are one of the few places in the southeastern U.S. where things like baskets, clothing, and other plant-based artifacts survive in the archeological record. Of particular interest are the examples of preserved food plants which give us an important and rare glimpse into the origins of plant domestication in North America. 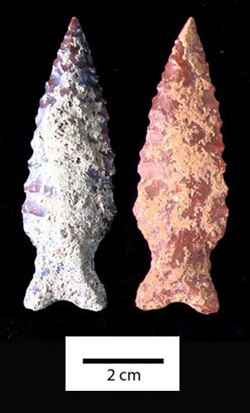 The oldest direct date archeologists have for an artifact in Arkansas is for this Breckenridge Dalton point recovered by Survey archeologist during excavations in 2012. Samuel Dellinger, the curator of the University of Arkansas Museum from 1926 to 1957, was among the first to focus on the archeology of bluff shelter sites in Arkansas. After its founding in 1967, the Arkansas Archeological Survey has continued this legacy and plays an important role in helping to preserve and investigate these important sites. Since 1999, the Survey has partnered with the University of Arkansas Museum Collections to house and curate these world-class collections. Researchers within the Survey as well as scholars from around the world have studied and published research about the bluff shelter collections. The Survey has conducted bluff shelter excavations as part of its Sponsored Research Program as well as in collaboration with the Arkansas Archeological Society, and the University of Arkansas Anthropology Department. For example, in the 1990s the Survey revisited two of Dellinger’s sites for limited excavations and reanalyzed the associated collections housed in the Museum. Craddock Shelter and Brown Bluff were both affected by development and the Survey was contracted to mitigate the impact to the archeology of these sites. Each resulted in a technical report published by the Survey’s Sponsored Research Program. The combination of reanalysis and new excavations strengthened our understanding of how bluff shelters were used in the prehistoric past. Three Arkansas Archeological Society summer Training Programs have focused on bluff shelters. Society Digs like these provide opportunities for the public to be part of uncovering Arkansas’s prehistory. In 1971 the Training Program was at Indian Rock House Cave in Marion County. In 1977 Training Program participants excavated two shelters in Washington County, and in 1994 four shelters in the Spradley Hollow area of Newton County were excavated with the help of Society volunteers. The Survey collaborated with Dr. Marvin Kay of the University of Arkansas Anthropology Department in 2012 to revisit the Breckenridge Shelter in Carroll County and reopen the excavations conducted by Ray Wood in the 1960s. The new efforts yielded a radiocarbon date associated with a Breckenridge Dalton projectile point found at the base of the excavations. This point, dating to ca. 9765–9555 years old, is the oldest scientifically dated artifact in the state. In 1932 Dellinger’s crews excavated the Edens Bluff Shelter in Benton County, Arkansas, along the White River. Among the other interesting artifacts found at the site was a bag of seeds. The Survey is also involved in continuing research on particular classes of material culture associated with bluff shelter sites. Dr. George Sabo received a three-year NEH grant to study rock art in Arkansas. Bluff shelters sites often contain both petroglyphs, images carved into the rock, and pictographs, painted images. This work resulted in both a web site and a book titled Rock Art in Arkansas. The Survey is also involved in the ongoing study of perishable materials in the bluff shelter collections. Survey Research Station Archeologist Dr. Elizabeth Horton is a paleoethnobotanist who is an expert on prehistoric textiles and the plants used to make them. Her dissertation on textiles found in Ozark bluff shelters is fundamental to our understanding of this class of artifact and the way prehistoric Arkansans used plants for cultural technology. The Survey continues to analyze older bluff shelter collections while formulating new research questions and engaging in small-scale new investigations to answer these questions. It is important to preserve these resources for the future and interpret them to the public. Last year the Survey launched a new web site that focuses on bluff shelters. If you would like to learn more please visit Bluff Shelters of the Arkansas Ozarks. A landing page for the new Bluff Shelters of the Arkansas Ozarks webpage.